ORLANDO, Fla., Feb. 11, 2019 /PRNewswire/ -- MobileHelp® Healthcare, a leader in personal and enterprise healthcare technology solutions, will be showcasing its MobileHelp Touch with MobileVitals – a remote patient monitoring (RPM) solution with integrated emergency response capabilities – at HIMSS 2019. 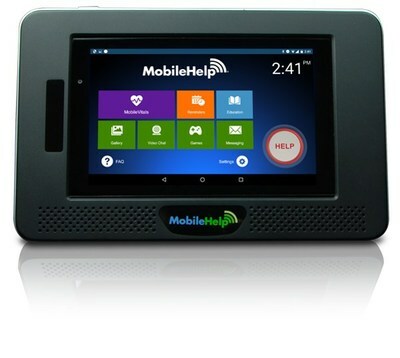 The MobileHelp Touch blends the safety benefits of a traditional emergency response system with the added personal and professional healthcare benefits of RPM technology – in one tablet-based platform. Designed to provide patients with an easy-to-use solution, the MobileHelp Touch gives healthcare providers the ability to provide patients with RPM for a variety of care models, for monthly care reimbursed by the new RPM CPT code 99454, as well as more traditional short episodes of care. This allows for greater patient and clinical engagement and offers an intuitive care management platform to ease rapid adoption. In addition, following clinical care episodes, the MobileHelp platform offers patients the opportunity to keep the tablet and peripheral equipment and continue monitoring their own vital signs on an ongoing basis. "We know better management of patients with chronic conditions reduces hospital readmissions and results in better patient outcomes," said Chris A. Otto, Senior Vice President of MobileHelp Healthcare. "MobileHelp Touch takes that to the next level by combining RPM and emergency response services in a single platform." Educational resources: Providing access to information, from disease-specific resources to broad-scale nutritional and exercise materials, the tablet allows patients to access information relevant to their own diagnosis. Amwell® Application: The MobileHelp Touch provides a direct link to American Well's consumer application, which gives users a direct video connection to doctors in their home state – 24/7/365 – which can eliminate the need for an in-person office visit or provide care outside of normal physician business hours. MobileHelp Healthcare will be showcasing the MobileHelp Touch with MobileVitals in several locations during HIMSS; more information is available here. MobileHelp® Healthcare is a division of MobileHelp, a leading provider of mobile Personal Emergency Response Systems (PERS) and remote patient monitoring technology. MobileHelp Healthcare provides healthcare organizations with a full range of telehealth product and service solutions designed to achieve better patient outcomes through enhanced oversight and reduced readmission. For more information about MobileHelp Healthcare, providers can call 800-995-1854 or visit the company website at www.mobilehelphealthcare.com.